Puppies, pooches and hounds of Somersham take note – have you got what it takes to ‘go for gold’ and take home the ‘Best In Show’ title? The winner of 2011’s ‘Best In Show’. Photo: JLC Photography Ltd. This year, the Novelty Dog Show will take place on Sunday 17th June at Norwood Playing Fields outside Victory Hall, Somersham. If your dog has got what it takes, then you can enter them into as many classes as you like. You’ll need to complete the entry form (below) and pay the 60p entry fee for each class they’re entered into. Entries can be made from 1pm on the day, and the judging will begin at 1:30pm. There’s a 1st, 2nd and 3rd place rosette for each of the 11 classes. 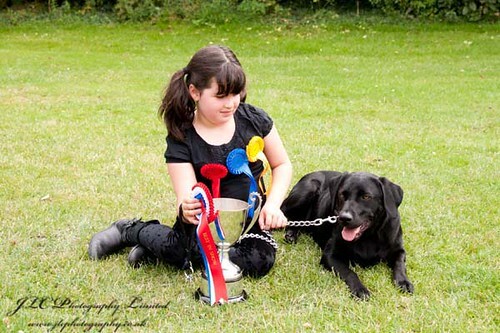 The winner of each class will then go through to the grand final where they will stand the chance of being named ‘Best In Show 2012’, with the winner being presented with the Christine Caston Memorial Cup. The Novelty Dog Show is presented and sponsored by ND’s K9 Academy. There will be an agility course set on the day but no dog under 12mths old will be able to go over the hurdles but can go on all the other equipment. All equipment kindly supplied by ND’s K9 Academy.